MEDZS has recently introduced a new breakfast menu at their Clifford Centre outlet, which is just 100 steps away from Raffles Place MRT Station Exit A. The new menu consists of usual breakfast favourites like scrambled eggs with sausage to easy-to-grab sandwiches for those on the go. It is catered especially to the working crowd in the area and is available from 8-11am, from Monday to Friday. The outlet has indoor seating as well as a semi-alfresco dining area; the latter was what we opted for because it had the best natural lighting and it was a good place to people watch. While waiting for the rest to arrive, we enjoyed the morning breeze along with our English Breakfast Tea and Peppermint Tea ($4.90 each). First to arrive on our table were the artisan sandwiches & baguette. We had the Olives Ciabatta with Prosciutto & Veal Paprika Lyoner Ham ($12.90), Laugen Brotchen with Pork Bierschinken & Red Cheddar Cheese ($11.90), Beef Pastrami with Rustic Baguette ($12.90) and Italian Panini Bread with Tomato Capresse & Buffalo Mozzarella ($12.90). Out of the four sandwiches, I found the olive ciabatta the most interesting. The distinctive sweet, sour and pungent flavour of the olives enhances the soft sponginess of the bread. This Scrambled Eggs with Chicken Sausage, Mushroom and Bacon came at an UNBELIEVABLE price of $5.90! While the eggs were slightly salty, it was very delicious and unanimously everyone’s favourite dish at the tasting. Sis introduced a new place for high tea to me! 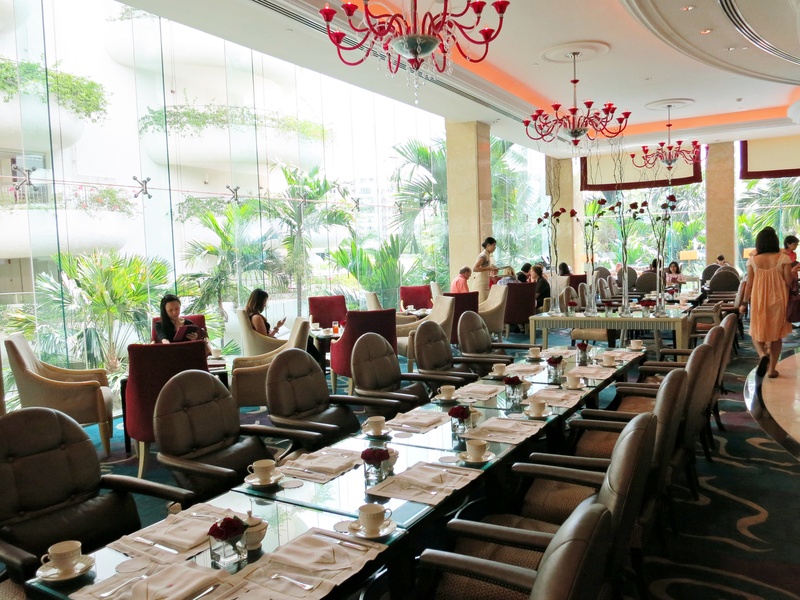 It is none other than Rose Veranda at Shangri-La Hotel. We did not really choose an appropriate time to go as they were having the Shangri-La Dialogue there during that period. Hence, the security was really tight and there were many dignitaries around. However, we got a good deal and I will tell how you can get it too! 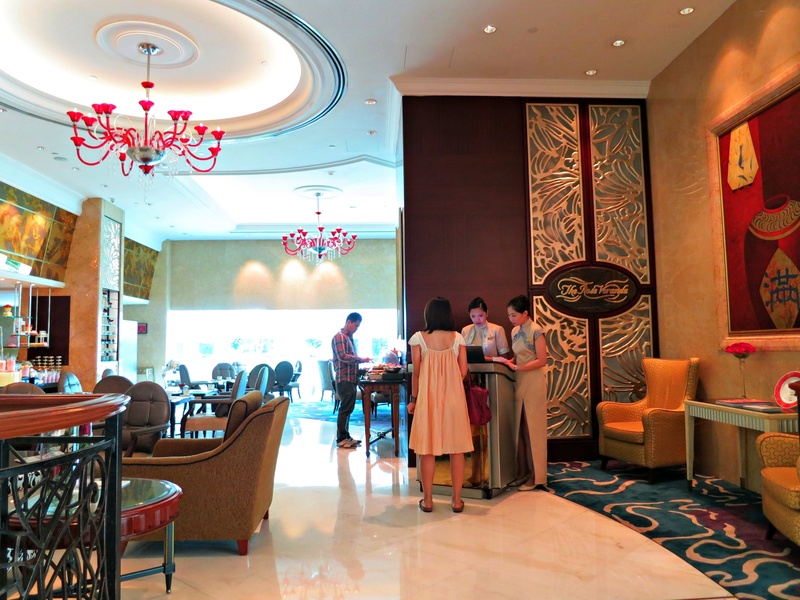 The Rose Veranda is located on the second floor, which is easily accessible through their huge winding staircase or via the lift. 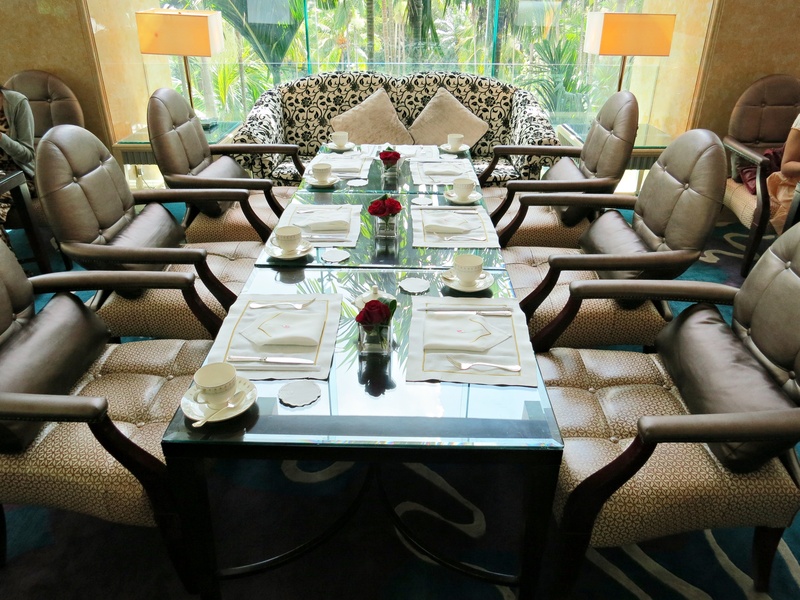 It is very spacious, with floor-to-ceiling windows, affording guests a view of the lush greenery outside. The place mat and setting provided were very dainty. 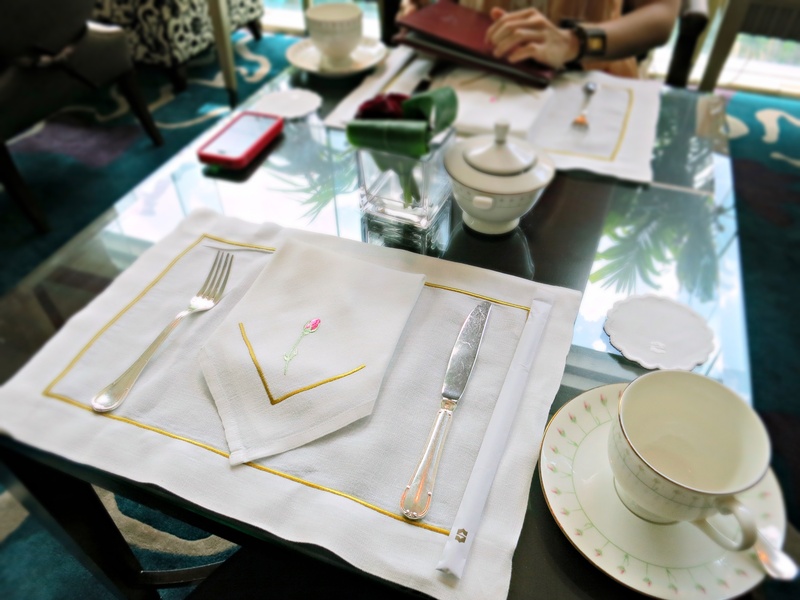 I simply adored the little floral prints on the napkins, cups and saucers.